Psychoanalytic theory, and in particular the innovations which the Lacanian corpus has leant to that body of work, has been taken up by a multitude of other disciplines in their attempts to better describe the dynamics inherent to their respective fields of enquiry. Although the progeny of this copulation of psychoanalysis with other disciplines has been variously assessed and not always in a favourable light, the least that can be said is that the meeting of the one with the other always produces something more, the new (w)hole being greater than the sum of its parts. This issue of our journal bears witness to some of the many rendezvous which psychoanalysis has kept with these other fields and, at the same time, attests to the impossibility of any cosy rapport of the one with the other. It is this thread of impossibility which winds its way through the present issue, beginning with Paul Verhaeghe’s article. He addresses the double impossibility inherent in the combination of two professions, that is, the impossibility of combining in any unproblematic way the teaching and the practice of psychoanalysis. Taken singly each presents with its own hopeless kernel, but the conjunction of the teacher’s position of mastery in respect of knowledge with the analytical position, in which ‘the analyst is the actual incarnation of the buffoon’, poses an impossibility of a higher order. There is a well-known saying that informs us about the two great tragedies in human life. The first one is not getting what you want. The second one is getting what you want. During my student days, I longed to become a psychoanalyst and I marvelled at the wisdom of some of my teachers. Twenty years later, I find myself back in the position of a psychoanalyst, and, to complete the disaster, I have been nominated professor at the state university of Ghent. Hence, not only do I practise psychoanalysis, I even have to teach it. In Freudian terms, this means that I have to face the combination of two impossible professions, and it is about this double impossibility that I would like to talk today. The central question concerns the status of this impossibility. For example, for Clement, it comes down to a question of exhaustion, and she expresses this loud and clear in the title of her book: Les fils de Freud sont Fatigues, The weary sons of Freud. She describes a scene in which she herself, being a psychoanalyst and a teacher, stands at the blackboard trying to explain to her students some freudo-lacanian subtlety, when she is suddenly caught by the utter impossibility, even absurdity of her effort. The way in which she describes her feelings of exhaustion and burn-out, together with the typical Parisian scenery, lends the whole thing a certain tragic ring. It is a common practice among psychoanalysts in Ireland – and no doubt in other countries also – to bemoan the lack of awareness of psychoanalysis among the general population. To this is added – sotto voce, for fear of appearing too mercenary – the complaint that it is impossible to make a living from analytic practice; a half-serious fourth to be added to the three impossibilities that make up the topic of the conference. Mindful of these complaints, some time ago I agreed to participate in a radio discussion on psychoanalysis. The show consisted of an half-hour discussion between myself and an interviewer who might be described as naive to psychoanalysis. It was typical of the difficulty in locating analysis in the field of generally accepted knowledge about humanity, that the programme was the final one in a series investigating the various forms of counselling and psychotherapy. The interview was not entirely traumatic in that the interviewer allowed the discussion to develop without the outraged objections that generally result at some stage from any attempt to transmit psychoanalytic theory. There is always some point beyond which it is impossible to teach psychoanalysis – like analysis itself, there is a rock on which it always founders. Thirty minutes was perhaps insufficient to reach this point. Such a discussion in the public realm, however, is not only a form of teaching but also of representation -in the sense that he who teaches in the public domain is assumed to be some kind of representative of the totality. There is an inherent impossibility in the representation of psychoanalysis, as borne out by my experiences following the broadcast. The radical heteronomy that Freud’s discovery shows gaping within man, can never again be covered over without whatever is used to hide it being profoundly dishonest. When we speak … of a divided subject, it is never to acknowledge his simple contradictions … it is a diffraction which is intended, a dispersion of energy in which there remains neither a central core nor a structure of meaning: I am not contradictory, I am dispersed. Over twenty years separate Jacques Lacan’s Function and Field of Speech and Language in Psychoanalysis and Roland Barthes’ anti-autobiography Roland Barthes par Roland Barthes. The conditions of production of the Lacanian and the Barthesian texts are quite different. Function and Field had been delivered to the Rome Congress in September 1953 at a moment of significant political import for psychoanalysis. In his Discours de Rome Lacan attempts to return psychoanalysis to its true parameters, that is, to speech and language. The Discours immediately assumed the status of a manifesto for the new movement in psychoanalysis. Roland Barthes par Roland Barthes was published in 1975 as a kind of serious joke, when Barthes was asked to do his par lui-même for the Ecrivains de toujours series. Its credibility was further called into question following Barthes’ own review of his autobiography in the Quinzaine litteraire, entitled Barthes puissance trois – Barthes par Barthes, by Barthes. Any coffee break conversation with Irish Lacanian students will confirm Lacan’s own assertion that the concept of lack is not in itself anxiogenic. ‘Ah yes’, people breezily say, lighting up a cigarette, ‘sure it’s all about lack you know’. 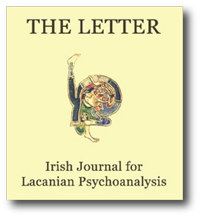 It is tempting to surmise that when Lacan describes subjectivity as resulting from ‘the organization of a hole’ or represents the subject as ‘the existence of a hole and his supplementary two sutures’1 that Irish analysts feel a degree of satisfaction in being not just scatologically but psychoanalytically correct when referring to a colleague as ‘a pain in the hole’. The term anxiety is an exceptionally inclusive one. It can be used to refer to the sudden falling away of the ground of one’s being in which time is abruptly suspended, or alternatively to the ongoing uneasy undertow which in itself constitutes the temporal dimension of human existence. Paradoxically Lacan locates it not as the opening up of a chasm but as the total filling in of a void which should be preserved. It is when there is nothing to keep this lack in place that anxiety appears. The system of language at whichever point you take hold of it never results in an index finger directly indicating a point of reality, it’s the whole of reality that is covered by the entire network of language. The conference theme, Ethics and the Desire of the Analyst, was addressed by speakers from England, France and Ireland under the four topics of ethics, transmission, technique and the cure. Concerning ethics, Lindsay Watson (London) wondered if the resistance to analysis in England was due to confusion between ethics and statistics. Helen Sheehan (Dublin) raised the question of the possibility of ethics, when the first appreciation of reality by the human subject is the Real, Das Ding, the ‘hostile one? Hara Pepeli (London) developed the ethics of Roger Money-Kyrle, and noted the lack of ethics in Kleinian theory. Andrew Hodgkiss (London) compared Nietzche’s Ubermensch and the desire of the analyst. Charlton, in South London, is now no longer known only for its soccer team; it was also the venue for the first of the one-day conferences run by the Greenwich Consortium of Psychotherapists on topics of interest to anyone involved in psychotherapy or related disciplines. The topic of the first conference, held in October 1995 was Trauma’ and the convenor was Dr. Martin Stanton, who will already be familiar to Irish readers through his work on Ferenczi and Laplanche. Three speakers, of whom I was lucky enough to be one, were invited to speak on particular areas related to trauma to a small but most attentive and interested audience. This book has a wonderful cover. A creamy-skinned young woman opulently overflows the confines of a strapless evening gown. Her head is thrown back and her tongue arched in anticipation against her red upper lip as she gazes at an oozing cream bun held aloft by her black-gloved hand. Unfortunately, like the cream bun, it is a book which promises more than it delivers.